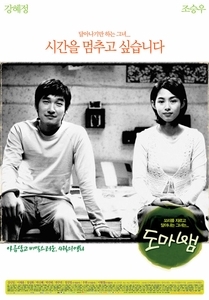 Cho Seung Woo (Marathon, The Classic) and Gang Hye Jung (Welcome To Dongmakgol, Old Boy) star in this curious romantic drama that spans decades. One sunny day, a young boy named Jo Kang meets a curious young girl, dressed in a bright yellow raincoat. Jo Kang instantly becomes friends with Ari, and falls instantly in love with the beautiful but rather strange young girl - only for her to one day disappear! The story jumps to ten years later, and Jo Kang is now in high school. One day, completely out of the blue, Ari contacts him and asks to meet again. Although they have not seen each other in a decade, they have a wonderful time together, and the love between them begins to grow once more. But then, Ari disappears once more, leaving Jo Kang devastated. Can Jo Kang track down his true love? Will he ever discover why Ari keeps disappearing? Will he be able to do anything about it? All will be revealed in the tender story of Love Phobia.